I was walking home with my dad one day, and he told me about how he tried the new McDonalds Seared Chicken Burger for lunch. Although with his 99%-complete English, the word 'seared' came out as 'shared'. So it went like that for about 2 minutes before I finally resolved the dispute with my mind-reading powers. Anyway, one of his claims was that the burger had a strong odour, not a bad one, but one similar to perfume. 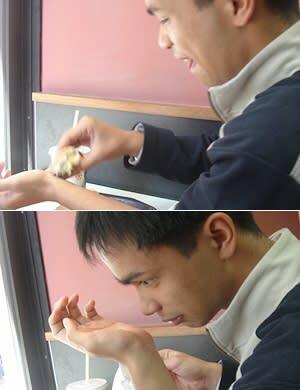 He said that the smell was strong enough that it actually distracted him as he ate it. That's a pretty strong claim. I mean, McDonalds smells like McDonalds, right? So at work the next week, I freed-up my lunch time, dialed my nose up to 11, and went over to McDonalds to see/smell for myself. McDonalds doesn't really change over the years - it's a constant of city living; a rock against the tides of metropolitan change. 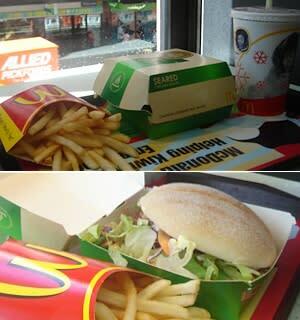 So if you've been to McDonalds within the last decade, then you'll know what McDonalds looks like now. And it'll look like that in other countries too; even though it's all managed locally, regional management does a good job of following most of the same steps and guidelines as their foreign overlords. The only thing that really differs between here and the US is that the ads make subtle jokes about Australians, and the posters spell colour with a 'u'. On this particular day, the staff were pulling out all the tricks to ensure that those waiting in line didn't have to wait too long, eg: someone was taking orders in advance, most of the tills were manned, and several other subtle things. This initiative during the peak lunch hours would normally be applauded, but with all of the staff concentrating on this duty, they neglected to maintain the cleanliness of the eating area. Bins were piling-up with so much rubbish that patrons would just leave their trays around them, and my photographer had to exchange her seat for one that didn't have the previous occupant's drink spilled all over it. Even after doing so she had to put-up with what remained in the form of a sticky floor beneath her feet. Anything else worth mentioning were factors purely beyond their control: crying babies, other patrons giving me evil looks because my kind took their jobs and brought disease, and a passing delivery truck whose sound system is trying to convert those nearby to the world of hip-hop and crunk music by repeatedly preaching the words "get out the way ho". The seared chicken burger is just 1 of 4 new chicken burgers from McDonalds; the other 3 being a version with bacon (add $1), and then crispy chicken variants of these 2. I opted for the non-bacon seared chicken burger under the advice that the bacon smell might mask or destroy the original fabled perfume smell of the burger. The box it comes in, a tad larger than the quarter pounder box, looks quite inviting, and falls in-line with McDonalds' latest effort to improve their image as a fresh/quality ingredient user. Opening the box however reveals a hastily assembled burger with as many ingredients outside the buns as there are between them. So what is supposed to be between its 2 wheat-germ-topped buns are a marinated seared chicken breast fillet, a slice of cheese, lettuce both green and purple, tomatoes, carrots, and a sauce that I'm just going to call mayonnaise to keep things simple. In comparison to the beef burgers, it's a much healthier choice in terms of standard and saturated fats. You can read the official nutritional data here, although any health benefits are somewhat displaced by the fact that the combo still comes standard with deep-fried salted potato and sweet brown carbonated water. Well, I didn't come here just to stare at the burger, so I started to test the myths about its smell. A basic wafting test didn't reveal anything major, nor did putting my nose within nanometres of the burger. There was maybe the faint smell of the marinade used, and my photographer detected possible mayonnaise, but neither or us were hit with the life-altering olfactory epiphany that my dad had experienced whilst eating the burger. Maybe that was the problem; maybe I had to eat the burger. So eat I did. 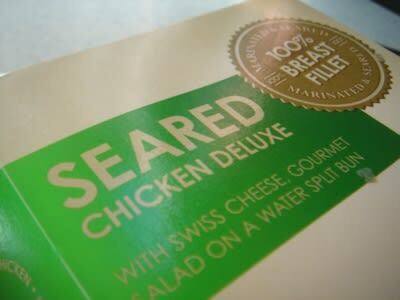 In line with the smells that were detected, the marinade is definitely the most noticeable ingredient when you take a bite into the it, followed closely by the chicken and the mayonnaise. This combination formed some sort of strange yet pleasant taste that wanted to invade my sense of smell. Perhaps this was what my dad was talking about? It did strike me as odd that a large portion of taste from the burger was being picked-up by my nose trying to break through the roof of my mouth. So what does a perfume test entail? Being a total perfume-testing n00b, all I have to go on is what I've been taught in movies, television, and whatever top-10 results Google will send my way. And from what I have gathered, it involves skin contact, noses, and some well-placed rubbing... oh yeah, and perfume (a list that's only a midget and video camera away from an R-rating). And so that's what I did, although exchange 'apply a sample' with 'rub arduously'. The result? Nothing. No Chanel No. 5, no Calvin Klein, but just the vinegar of the marinade and whatever composed that mayonnaise to create something you'd more likely find in a fridge-freezer than the perfume stands at Farmers. I wasn't even able to test that last metaphor because the smell was so faint that I didn't think it would survive a trip to said Farmers store. Overall, good enough for the working-class crowd, and a nice addition to the McDonalds menu. A tad expensive considering what you get, but the extra cents go towards putting you on the slower path to a coronary. Don't believe the hype, don't expect perfumed food, and you might be pleasantly surprised.